This is a torsion catapult, at the cross bar still lack the protection against the throwing arm. The whole tension and release mechanism is or has been revised again. This - one of my favorite types of throwing machines! And I am very pleased Connie, that you also like to do them. I also agree with Michelle that the wheels look a bit weak for the masses. But this does not spoil the view. I also want to say that I had made ​​such a catapult, only large and active. So mind catapults you want - or heavier rear - or lengthen the front part, as an impact, "spoon" will bounce back (like a wild horse). Well I just assembled the Trebuchet earlier today and I can only say... keep them coming! here even a picture of a functioning catapult the same type from a British museum. On the top photo shows the right thing - and the wheels and the correct ratio of the masses "spoon" to the total weight of the catapult. At the lower figure shows - how the wheel is not correct. But, in fact, your catapult, Conny, great and all remarks are not so important! Is it possible to see the photo next to a soldier? when I make the next pictures, I make one with a figure. Jens and I would like to make a bull, a cart to carry catapult disassembled (the march). And also people who are pushing this cart. And run the bulls. You interested in this idea? 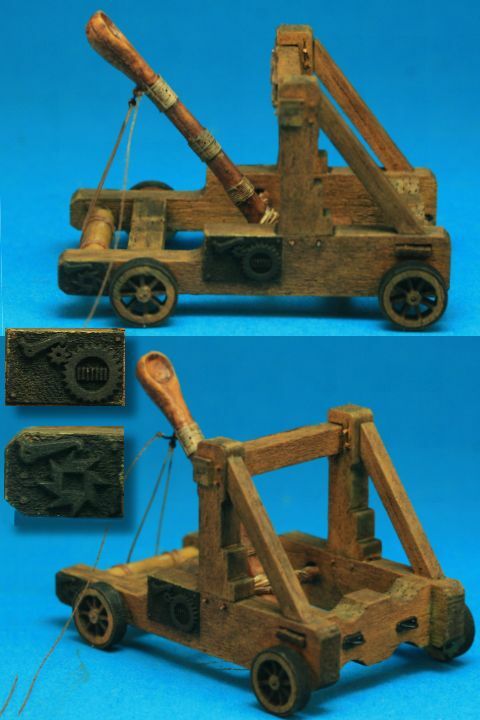 yes of course, we produce on end of december a crew with 7 figures for the Trebuchet und the new catapult. Let me know what do you need. @Alex and Conny...definately...the cart with broken down catapult in a cart and people for it..pushing etc.. Such a thing I need for my medieval baggage train!!!! Alex, Conny This sounds very good. I´m glad, that figures for the siege will comes !